Here’s more proof that Hamtramck’s Bengali community is a major voting bloc. The federal government is now requiring the city to print all election material, including ballots and candidate nominating petitions, in the Bangladeshi language as well as in English. 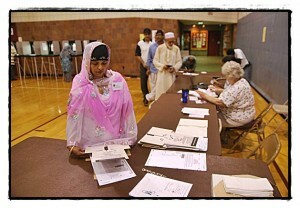 That’s because, according to the U.S. Census, the Bangladeshi community is sizeable enough to warrant separate ballots. The agency said it used a variety of data to determine this mandate, but just what exactly the decision was based on was not immediately known. Hamtramck is not alone in being ordered to print separate ballots. Some 248 voting districts across the country have been told to print up separate ballots for their dominant ethnic group. City Clerk Ed Norris said the mandate will mean an additional cost to the city, but he did not know how much more elections will now run. He said there is not enough time to ready ballots for the Bengali community for the Nov. 8 General Election. The next election after the November election is the Republican Primary on Feb. 28. Norris said he’s not sure if the additional ballots will be ready by then, either. “We’re going to try to comply the best we can, as soon as we can,” he said. Part of the problem in getting ballots ready is finding both a reliable translation service, and a printer that has the proper font for the Bangla language. Another issue to figure out is who is responsible for preparing and paying for the separate ballots when elections are under the jurisdiction of the county or state. Not all elections are solely city elections. Norris said trying to coordinate this mandate with county and state officials is another hurdle to jump. In the online social network site Facebook, there has been criticism of this mandate. There are some who believe that if you are a citizen and are eligible to vote, you should be able to understand the English language. But the Voting Rights Act of 2006 mandates special language ballots for there is a significant ethnic presence in a community. Norris said that there is no appeal option to challenge the mandate. Norris added that the city has already provided some election material in Polish, Arabic and Bangla.